Peter could hear the call of the sailors at the docks. He knew what their calls and the sudden bustle of business men moving toward the harbor meant: yet another slave ship was arriving in Cartagena. He quickly gathered up his bundle of food and drink and wrapped it in the blankets he had ready. He put these things in his cart and joined the hustling masses as they made their way to the harbor to process the slaves who had just now arrived in Cartagena having descended into agony months prior. Slavers brought in approximately 1000 slaves a month to Cartagena in order to keep up with demand. Because of the high interest, this was a very profitable route. However, because of the casualty rate on their ships (due to malnutrition, hygiene, and general abuse), they packed more and more men and women onto their ships to "cover their losses." The African men and women had become a commodity that was poorly treated but highly demanded. Peter approached the captain before any slaves could be brought into the marketplace and used his status as a priest to persuade him to let him come aboard. The captain knew this priest well and had no affection for him--Peter was well known as a "slave sympathizer"--but he could not openly refuse a priest's acts of compassion and mercy in front of such a crowd. Peter climbed aboard the ship and descended to the cargo hold. There, he was the first white face that many of these slaves would look upon since leaving Africa. He quickly worked to demonstrate his love to them. He helped removed the bodies of the deceased. He learned and call them by their names. He brought food and drink that he gave them freely and gladly. He bandaged their wounded and cared for their sick. With the help of interpreters and friends, he made known to them that they were people worth knowing and loving and not things. In the bowels of the slave trade, Peter subverted the hold of the slavers upon the minds of these abused men and women. He told them of a different kind of Christianity that was about setting free the captive and providing forgiveness and love without charge or coercion. Peter was at an incredible disadvantage: he was trying to make up for the evils of his brothers and sisters in the minds of these slaves but he was willing to try. Peter became known as the "slave to the slaves." He taught them about a loving and liberating Lord who led a Church that welcomed them as equal parts of one Body. Constantly, Peter was pushing a boulder up a hill as he fought to love those that his neighbors abused, broke, and dehumanized. He broke bread and shared in communion with the slaves. He followed them to the plantations where they would be held. He met with them and worshiped with them. He poured out his life for those whom others labeled as worth nothing more than what their short lives could produce. Though it meant that Peter was abused and mistreated (and would die alone), he still offered a radical and beautiful love to the people whom he met on every ship that came into the harbor. Over thirty-three years of this ministry--amidst cruel opponents and overwhelming odds--Peter denied what he could have had if he would have minded his own business and, instead, minded the well-being of his brothers and sisters who he met for the first time in the cargo holds of slave ships. 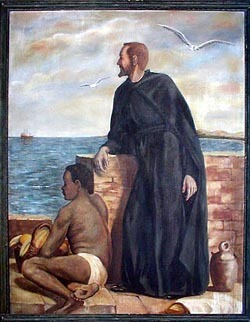 In those thirty-three years over 300,000 slaves would find the loving Lord that Peter Claver followed. He may have been pushing a boulder up a hill and fighting against impossible odds but, yet, Peter was doing the work of the Kingdom the entire time. Peter was following his Lord into the clutches of a broken and evil world so that some might be saved and changed. He descended repeatedly into the hell of the slave trade only to bring some out and go back, again, when the next ship arrived.